Hollywood dress styles always lead the fashion, the choosing of the celebrity effects the fashion world deeply, and then have wide influence all around the world. Pregnancy style is super important in Hollywood, if you let yourself go during this time, you might never be able to get yourself back. Celebrities in pregnant try various styles of maternity, no matter what kind of occasion they will attend, they find the perfect dresses to make them be the sparkling point on the red carpet or in street snap. Here I do collection of the hottest maternity celebrities; they all dress stylish, in elegant evening dresses, or in the formal daily dresses. From the pictures above, I can conclude that the celebrity prepfer plus size maternity dresses very much, such as Reese Witherspoon,Angelina Jolie. The plus size dresses will make them more comfortble, and I think it is the most vital thing when you pick a maternity dresses. For the reference of Reese Witherspoon's long blue evening dress, I display another blue maternity dress for you. 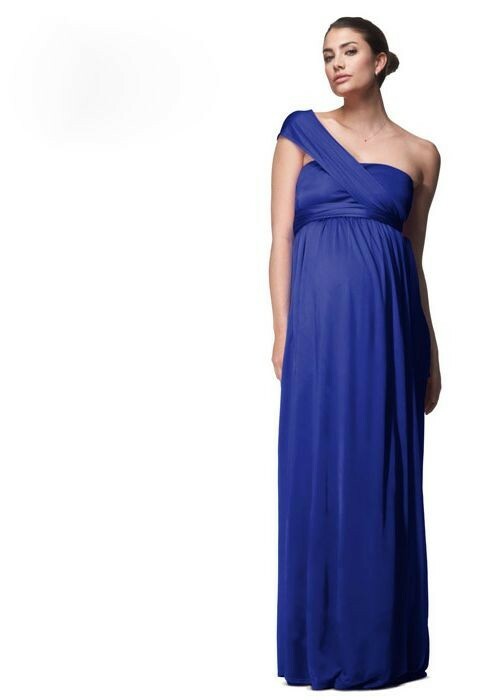 Personally, I refer pregnant women in blue dresses which is graceful and cute. And the dresses below, will perfect for you to attend a wedding party or an important evening party.